December 21, 2012, will forever be a special day in our house. That was the day that S&J’s adoption finalized in Court. What else was significant about that day? Well, the world didn’t end (all of the “world ending” rumors remind me of this episode of Parks & Recreation) AND it was the shortest day of the year. Our family woke up super early because we had to drive about 3 hours to get to the Court where the adoption would finalize. One of our daughters (cough, J! ), woke me up at around 2 a.m. the night before because her tummy was upset. She tried to blame it on Eric making her eat her vegetables, but we are pretty sure it’s because she ate almost an entire gingerbread house that she had made at school that day. Our friend, Andy, came along and was our photographer. He was very patient, and even let the girls take turns using his camera and pretending to be a photographer. Again – he was very very patient. My mom, Eric’s dad, and Eric’s dad’s girlfriend also attended the finalization. Between the social workers, the Guardian ad Litem, the community mentors, and the grandparents, we had a pretty full courtroom. The Judge swore us in. The Guardian ad Litem spoke. The Judge asked Eric and I about 5-10 questions each. 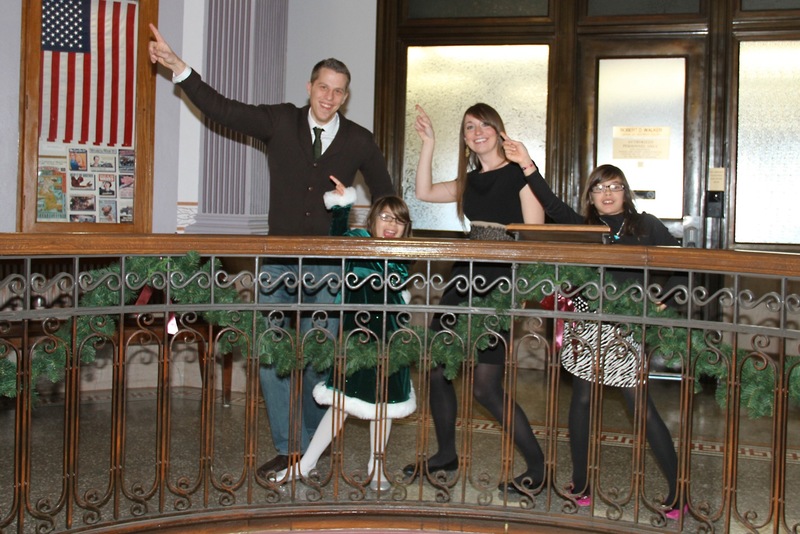 Then the Judge signed the Order – finalizing the Adoption! While the Judge was signing the Order, S&J started to fight with each other. I wonder if the Court Reporter transcribed their fight? Thinking about that reminded of another Parks & Recreation episode – I swear I am not being paid by NBC to write this blog – I am apparently addicted to Parks & Recreation, though. Anyway, I thought about buying a transcript of the hearing just to see, but so far I have managed to hold myself back from doing so. The Judge let us take our picture with him, and he let the girls sit in his chair. He also remarked, “the girls aren’t really impressed by this room are they?” I am assuming he was referencing their goofing off during the hearing. After the hearing, we headed back home (a nice 3 hour drive). I posted several pictures of S&J on Facebook during that drive (Eric was driving, not me!). Before the adoption had finalized, we were not allowed to post pictures of S&J on Facebook, so I wanted to make up for lost time and post as many pictures as I could of our family 🙂 When we got home, we ate dinner and headed to the Water Park of America to celebrate. It was a late night, and I think S&J actually stayed in bed until 9 or 10 a.m. the next morning. It was a miracle!